On server-based environments, an image of the application is delivered to the client UI. This is why CitraTest VU® relies on advanced intelligent image recognition capabilities –automatically built into every testing script – to simplify load testing configuration, and reduce time and efforts on your side. "Load generating machines" are used to generate user load against the server environment under test, while "measuring machines" actively measure response times at the client UI and gather server performance metrics on the back-end. Each CitraTest VU® test script executes on its own "desktop" and opens its own client connection to the server-under-test, just as a group of real users would. 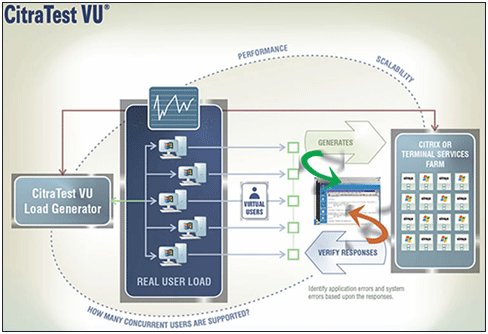 During a test, CitraTest VU® measures and reports end-to-end response times at the client GUI by automatically comparing the screen to baseline response images created during test script development. A single load modeling scenario can vary the number of CitraTest VU® scripts stressing the server(s) and observe the effect on client side end-to-end response time for various levels of load. CitraTest VU® is the only test automation solution that replicates real user activity using the actual client connection GUI, exactly as a real user would, without installing any software in your production environment or modifying your application code. With a CitraTest VU® load test, the most important metric is measured & analyzed - the end-to-end client side response time. Is end-to-end response time acceptable, and does it meets your service level requirements based on a predefined number of concurrent users? Do you want to find and isolate performance bottlenecks and constraints before your users are impacted?